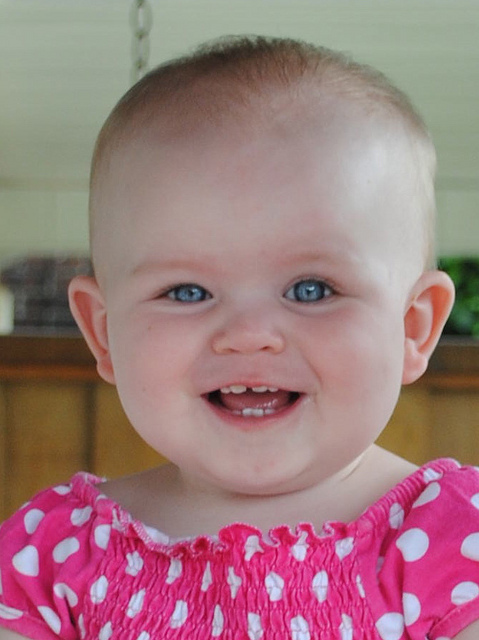 My niece Eileen, affectionately called "Lenny" by one and all, is about to reach her 10th month birthday. It is time for Aunt Paddy aka Caftan Woman to stake her territory and I offer myself as a consultant in Lenny's classic movie education. Her parents are certainly more than capable, as her musician father knows all there is to know about Star Wars and her mom, my sister, was raised in a read-the-credits family. However, as I look back on my parenting the only thing I can recall doing was introducing my kids to classic movies - and yet, they thrived. I think it is for busy parents such as Tracey and Jim that TCM introduced their summertime feature Essentials Jr. and this year's host, Saturday Night Live's Bill Hader, will probably already be familiar to Lenny from many a late night teething session (check out those choppers!). I don't believe 10 months is too early to take advantage of the opportunity afforded by everyone's favourite cable channel. First up on June 5 is Warner Brothers The Adventures of Robin Hood. Not to overwhelm Lenny, I will suggest a few tidbits to mention while the movie is playing and she is chewing on something (again, the choppers!). Number one: Look at all the pretty colours, Lenny. The movie was filmed in "Technicolor". Oooh! Aunt Paddy's supplemental: Technicolor was a special system using three strips of film, very big cameras and lots of lights to film a movie. It was a difficult process and cost a lot of money. The movie studios used it when they wanted something to look extra special. Nowadays we do not have movies in Technicolor because people found less expensive ways to make colour and because it is not fashionable. Sometimes people think things are better if they are new, but this is not always true. It is important to know what people have done before you were born so you can decide what should be changed and what is worth keeping. Number two: How do you like that music, Lenny? It was written by a man named Korngold. 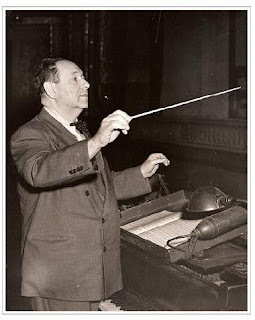 Can you say Korngold? 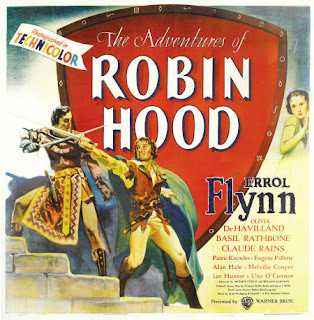 Aunt Paddy's supplemental: Mr. Korngold did not want to write the music for the movie of Robin Hood because he thought it was a silly story about men in tights fighting with swords. He wanted to go home to his country of Austria, but some bad men called Nazis marched into the country and took away everything he loved. Mr. Korngold was very mad and sad, and he thought the movie of Robin Hood fighting for people who had everything they loved taken away was not a silly story after all. He wrote music that makes your heart beat fast in your chest. Number 3: Isn't the lady in the movie riding a pretty horse, Lenny? 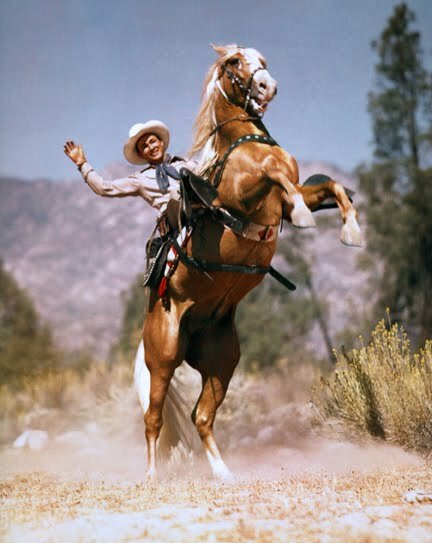 The horse's name was Golden Cloud, but he would become world famous as Trigger, the Smartest Horse in the Movies. Aunt Paddy's supplemental: Roy Rogers was a singing actor who made western movies that kids loved to see. The studio he worked for rented Golden Cloud for Roy to ride and Roy thought he was the most beautiful and smartest horse in the whole world. Roy called the horse Trigger. Roy asked his boss to buy Trigger to be in all his movies. Roy's boss, Mr. Yates, was cranky and said "Do you think I am made of money? You like the horse so much, you buy him." That is just what Roy did and every time Trigger was needed for a movie, Mr. Yates had to make sure it was okay with Roy. Ha, ha. Roy and Trigger were best friends forever. Number 4: "Hooray!" At the end of the movie when the good guys beat the bad guys we shout "Hooray!". Aunt Paddy's supplemental: In the world outside of adventure movies the good guys do not always win and that is sad. However, no matter what you do in your life the number one most important thing is to be a good guy. Hooray! I love this sweet post. Lenny's off to a good start. Especially like: "read-the-credits family". Same here. Thank you, Jacqueline. It looks like I've mapped out my summer blogging. That is, if Lenny's folks don't mind. Lenny is very lucky to have such a cool aunt. Wonderful post. Thanks, Kevin. I'm rarely called cool by others. Usually have to do it myself! Clap, clap, clap! Hooray for Aunt Paddy! 'The Adventures of Robin Hood' is a wonderful choice, TCM rocks. Your supplementals are informative, fun and very touching. A great plan, a great film, and a great family. Isn't being an aunt amazing?! Lennie is such a lucky gal! With your permission, MTN & Co., I shall continue throughout the summer with little words of wisdom for our Len. Thanks, novabreeze. Your applause is most welcome. Yes indeedy, Kim, being an Aunt is amazing! All in all, a great new learning opportunity for Lenny. Good job. Sometimes our kids interests go in fields we never would have expected, and they can take us along for the ride. What a great post! Lenny is a doll. I did the same thing with my boys and now with their children. If the movie is black and white, sometimes they groan, but it only takes about 5 minutes to get them mesmerized by Laughton's Hunchback or Karloff's Frankenstein. Now they adore Vincent Price and we watch his movies all the time! Of course, most importantly, is Errol Flynn in Robin Hood as your choice for Lenny! You smart woman, you. Fun for you AND Lenny! Beautiful Technicolor, exciting action, and even more beautiful Flynn...what more could a woman (or a baby) ask? I am really looking forward to your summer posts! Sharing movies may be the best thing about movies, Becky. You already know that! Great post. Will watch Robin Hood. Congratulations on 2nd place for the Haiku contest! And congratulations back to you, Ellie. Wasn't that a kick? I agree with Jacqueline, Lenny is off to an excellent start. 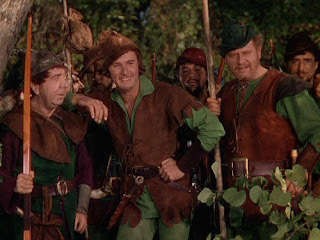 Of course THE ADVENTURES OF ROBIN HOOD is one of my all time favorites, so how can you go wrong? Yvette, I see we are of a like mind in that you cannot start too early. Who knows what this strong grounding in the classics will do for Lenny and your granddaughter. It will only be for the good. Many congratulations, Jandy. I have fond memories of bonding over movies with my folks and then with my kids. My sweetheart of a niece is the icing on the cake.